URGENT ALERT: Our Emergency Rescue Team is on a boat right now rescuing desperate pigs left on an island to fend for themselves. I thought I had experienced every kind of rescue. Then today happened. I’m on a boat right now with a 10-person rescue team desperately trying to ferry a half-dozen starving, terrified pigs to safety as quickly as possible. The pigs have been trying to survive on a small island in the San Joaquin Delta in California’s Central Valley. 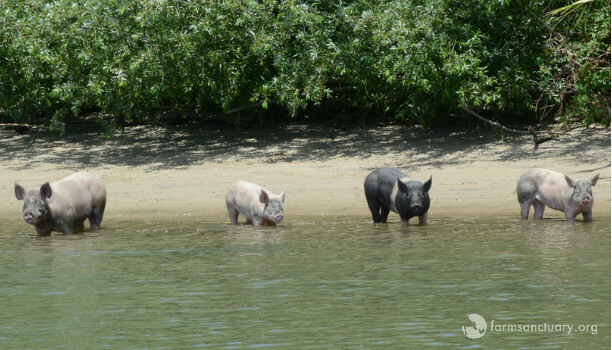 A group of pigs were dropped on the island several years ago by people thinking they would be able to control the water hyacinth that was clogging the channel. And although the pigs likely cleared a few plants they are not aquatic mammals. And sadly around 4 years ago, those pigs were just left there to fend for themselves. The original pigs have long since died. Those remaining are their offspring — sick, scared, and struggling. As our boat pulled up to the island, the pigs immediately swam to us. They’re terrified of humans, but willing to set their fears aside for the chance of some food. One of the only times they get to eat is when boaters come by. Tragically, as word of “pig island” has gotten out, people have come to the island to get a glimpse of the animals — and many visitors had cruel, misguided intentions. Some hunted the pigs for food. Others thought it was hilarious to ride and harass them and even get them to drink beer. 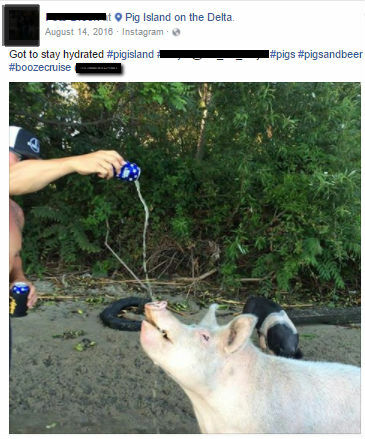 There has even been recent talk online about killing the pigs for a pig roast this August. This rescue is like nothing I have ever experienced before. We’ve been dealing with dense woods, water surrounding us, and pigs who have lived their entire lives without care of any kind. But we will not fail these pigs. Please help. We have the opportunity to save these pigs and give them a life of peace and happiness. Please donate now to help Farm Sanctuary succeed in this urgent rescue operation and continue being a rescuer and caregiver for farm animals in need. These pigs had been abandoned on Pig Island — starving and without medical care. Just getting them onto the boat was a major undertaking. These pigs are large — the adults are probably 400-500 pounds each — and when pigs are scared, they’re strong. We set up a chute system to get them onto the boat. These pigs are acting feral and attempting to get them into crates without causing them to run and hide would not have worked. We also could not put them in a boat that could tip with these large agitated and frightened pigs in it. With all of the pigs now on the boat, I’m finally breathing my first sigh of relief since we heard about these animals in crisis. We brought our trailer right onto the boat, so I’m confident the pigs are in the safest conditions possible now for the journey back to shore. But once the boat docks, our work really begins — and we need your help. I have not been able to examine the pigs yet, but just by looking at them, I can tell you that they are very sick. They are way too thin, which could be because of hunger, poor nutrition, parasites, disease — or any combination of these factors. I suspect that one or more might be pregnant. We’ll be rushing them to a large-animal veterinary hospital when we reach land. I’ll be able to tell you much more after they receive full physicals — the very first of their lives. I’ve noticed that their feces are liquid and black and smell putrid, an obvious sign that something is very wrong. But we have made a promise to these pigs, and I hope you will help us keep it. We need your generous support four our Emergency Rescue Fund. If we can get nurse these pigs back to health, we can find them loving homes through our Farm Animal Adoption Network which allows us to rescue twice as many animals. Giving them a wonderful new life will just take specialized care and your generous support. Please donate now to support our Emergency Rescue Fund to allow us to continue rescuing farm animals no matter what the circumstance, transporting them to safety (even by boat! ), and ensuring their lifelong care so that they will never suffer like this again! P.S. In times like this I am very grateful for all of the people like you who are willing to help in a crisis — and for the hundreds of members of our Farm Animal Adoption Network who graciously open their homes to farm animals in need. Please visit us at bit.ly/FarmAnimalAdoption for more information about our Farm Animal Adoption Network.